Did Thomas Edison achieve the smallest handwriting in the world? A rare historical document says yes. Did Thomas Edison achieve the smallest handwriting in the world? 25 SEPT 2018 -- It is almost as if the "Wizard of Menlo Park" suddenly has some explaining to do. A well-worn slip of paper containing the micro script handwriting and signature of Thomas Edison has been examined and certified authentic by handwriting experts. It contains the opening line from the Holy Bible's rendition of the Lord's Prayer in all lower-case lettering: "our father who art in heaven hallowed be thy name". This line is then followed by a signature of "Thos a Edison" ... the world famous American scientist and inventor. The handwriting is so small that it cannot be read with the unaided eye. A strong magnifying glass or microscope is needed to read it. It is extraordinary that one of the greatest minds of the 19th and 20th century would choose the opening line of the Lord's Prayer for a micro handwriting sample. Edison's inventions, along with his improvements of others' inventions, changed the entire world ... including our world of the 21st century. Its rarity, the minute size of the handwriting, along with the chosen content, work together to make all other of Edison's more common, historical documents pale in comparison. It is, word-for-word, one of the highest prices ever paid for a Thomas Edison exemplar. 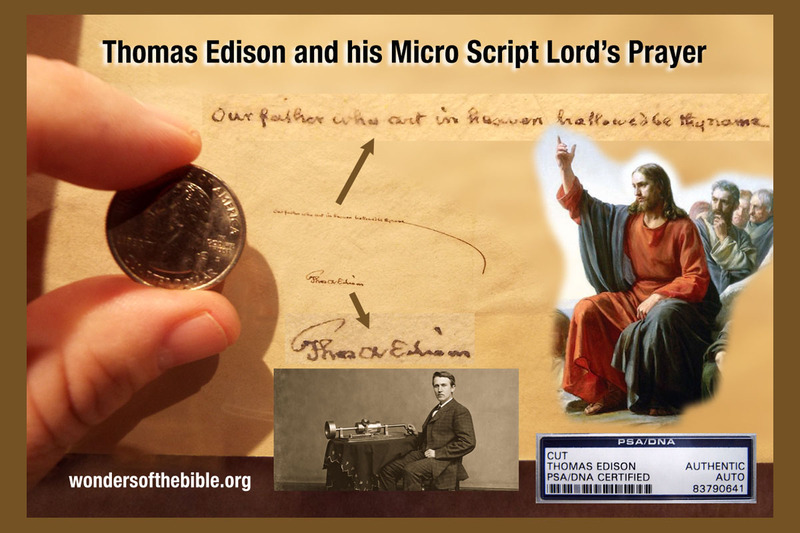 (above photo): Micro script Lord's Prayer (enlarged) hand written by Thomas Edison, and shown next to a U.S. dime for size comparison. As a representative from the auction house stated: "Some items come into the building and just stun us. This offering is one of those ultra-unique items ... The motivation as to why Edison chose this quote to write is unknown, but the fact that he writes something of this nature with religious overtures is interesting ... Whatever the motivation was in creating this piece, it sure makes for one heck of a cool piece of memorabilia!" The Microscopic Craze of the 19th Century. The period from the late 1800's to the first few decades of the twentieth century was a time of extraordinary advancements in the arts, sciences and communication technologies. Like many of the great minds of the era, Edison was riding the crest of this revolutionary wave. One of the advancements was miniaturization. Of everything. The most prominent method of exhibiting achievement in miniaturization was the recording of the Lord's Prayer: smaller and smaller. For over 150 years, the Lord's Prayer has been considered, and practiced, as the reference standard for demonstrating all advancements in miniaturization. Several methods were commonly used: micro script handwriting; microphotographs; micro etchings and engravings; micro printing, and those done by the famous pantograph machines. Later in the 21st century, examples continued (and advanced) via vapor deposition, electron bombardment, and the first nano scale Lord's Prayer recorded as a laser hologram. (above photo): Microscript Lord's Prayer (enlarged) hand written by Thomas Edison, authenticated, certified, and encapsulated for life. With all that Edison invented to his credit (1,093 patents), he did not, however, invent the micro craze of the 1800’s and early 1900’s. That credit must go to a microscope manufacturer in Great Britain by the name of John Benjamin Dancer. Dancer was the inventor of many optical devices, including the first 3-D camera. He also invented what was to become known as microphotography. 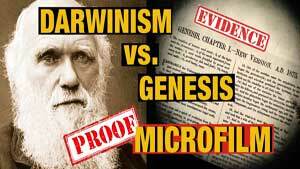 Microphotography took what was life size, and reduced it down to a photograph with a diameter of a millimeter or so. Famous paintings, manuscripts, and even places of interest throughout the world (such as Niagara Falls), were captured as microphotographs. It was a brilliant move, as Dancer’s microphotographs helped him sell more microscopes. One of his very first microphotographs was of the Lord’s Prayer. Others -- 150+ years of others -- quickly followed suit via a variety of methods. To see this piece in person is to observe a thing of historical and natural beauty. I might add technical beauty to that description as well. Thomas Edison is well known for his penmanship: practicing scripts and inventing typographical fonts for the printing press (Edison ran a printing press when in his youth). When one views the writing sample, one sees a line of something, but it is difficult to make out what that line is (other than a line). But view that line under a magnifying glass or microscope, and it enlarges into an astonishing line of the tiniest handwriting: "our father who art in heaven hallowed be thy name" ... then signed underneath by Thomas Edison, in a micro script signature that very well may be the smallest autograph in the world. Ever. (above photo): A photo collage of Thomas Edison's Lord's Prayer. Click or tap on the photo to see it in HiRes and/or print out your own copies as standard 4 x 6 photos. There is no limit to the number of copies you may print. Courtesy of Frank and Debi DeFreitas at Wonders of the Bible. Another aspect that makes this piece unique is the incredibly small handwriting that Edison utilized to execute the quote and autograph. Edison, being a constant learner who challenged himself on virtually all fronts of life, apparently learned the art of micro scripting -- writing at a near minuscule size -- simply for the challenge of it. Which begs us to ask and to answer one question: "*WHY* did Thomas Edison write the Lord’s Prayer in micro script handwriting?". For some, the thought of Thomas Edison choosing to use the opening line of the Lord's Prayer for a micro handwriting exemplar would seem a bit outlandish. While never disrespectful, the late, great inventor / scientist / titan of industry was well known to harbor a bit of disdain for religion, in all forms, and was not reluctant to express it either vocally or in print. For the curious, a simple query of any search engine will bring up scores of quotes of Edison and his thoughts on religion in general. On the one hand, it could be said that Edison chose the Lord's Prayer solely to dip his toe in the micro miniaturization waters. Since it was the de facto exemplar used by so many others, it was the one he chose as well. The practice itself was more a competition between scientists and technicians than in the entertainment of a general populace. Each trying to “out small” the other. 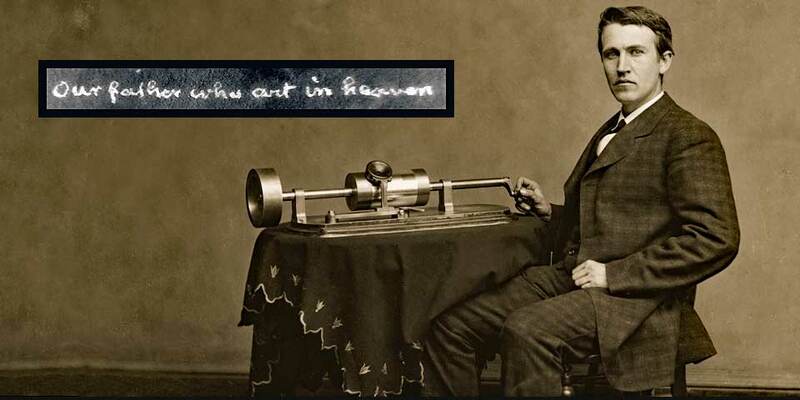 Was Edison's Micro Lord's Prayer Divine Intervention? On the other hand, perhaps there had been Divine providence at work behind his decision and his pen: that a scarcely-known (until present), single handwriting exemplar would follow his historical name far into the future. After all, something drove him to write it in the first place. It wasn't for mass reproduction or for monetary income generation -- there is only one known example. Taking his quotes on the subject (religion) into consideration, it doesn't seem as if he would write something -- and sign it -- that he felt so strongly against (providing that is the case in the first place). The Lord does indeed work in mysterious ways. (above photo): Bringing it back home? Is this the desk where Edison wrote his micro script? 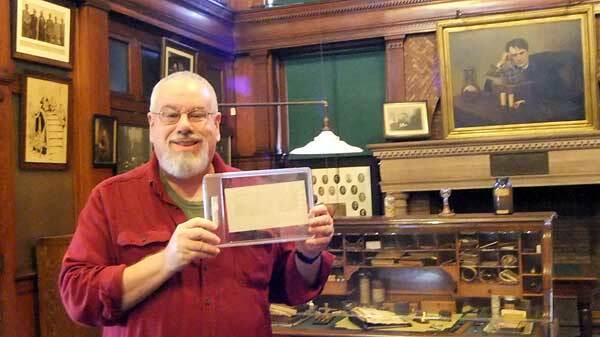 I am standing in Thomas Edison's research library with his famous desk in the background. Thomas Edison National Historical Park, West Orange, New Jersey. Or was it written in Menlo Park? As an interesting side-note, upon our recent visit to Edison's National Park laboratories in West Orange, New Jersey, we decided to take the additional house tour of the Edison mansion named Glenmont (no indoor photography permitted). One of the displays on the upper floor contained the Edison family Bibles. Edison had his name embossed on his Bible in what appeared to be faded gold leaf: Thomas A. Edison. The best way that I could describe his personal Bible is that it looked to have been heavily used over a long period of time. Indicating that God is the Father of everyone, not just one individual or group of individuals. The use of "OUR" Father would include himself. The "Father of all" ... OUR Father. Edison has stated that he did not believe in an afterlife, although he did believe in a higher intelligence. This phrase indicates where he believes his Father resides: in heaven. The word "who", rather than the more common "which", originates from the Anglican Book of Common Prayer, and later the Douay-Rheims 1899 American Edition. The King James Bible has always used "which". Although I am not a Bible scholar. Any correction, if needed on this, is appreciated. Merriam-Webster puts it this way: Definition of Hallowed: Holy, Consecrated; the church stands on hallowed ground. Hallowed is the past participle of the verb hallow, a term that descends from the Middle English halowen. That word can in turn be traced back to hālig, Old English for "holy." The "Hallowed be thy Name" phrase is the first of the seven petitions in the prayer. Let us now turn to Matthew Henry's Commentary for the following: "Hallowed be thy name. It is the same word that in other places is translated sanctified. But here the old word hallowed is retained, only because people were used to it in the Lord's prayer. In these words, (1.) We give glory to God; it may be taken not as a petition, but as an adoration; as that, the Lord be magnified, or glorified, for God's holiness is the greatness and glory of all his perfections. We must begin our prayers with praising God, and it is very fit he should be first served, and that we should give glory to God, before we expect to receive mercy and grace from him. Let him have praise of his perfections, and then let us have the benefit of them." Now, keep in mind, that Thomas Edison not only wrote the opening to the Lord's Prayer (as above), but did what many others before him did not do: he signed his name to it in his own hand (It is well known that Edison was very particular about his signature, and "redesigned" it several times throughout different times of his life). Many others, such as the early microphotographer John Benjamin Dancer did include their name. But it was part of the art work content of the slide photographic image, and also part of the label on the slide (in many cases, just initials, such as J.B.D., etc.). 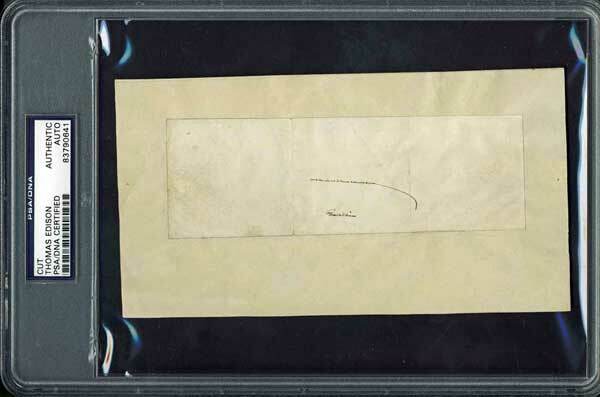 In this case of Thomas Edison, it may very well be the smallest signature autograph in the world. Perhaps the most exciting part of this piece of history is the fact that Thomas Edison held it in his own hands, and wrote onto it using his own pen at his own desk. In real life. As an avid collector, I would love to hold it for a moment in my own hands. But that will not happen. It was hermetically sealed and encapsulated in a tamper-evident slab of acrylic, right after it was authenticated. It is kept in remote storage, so I don't even have it here to look at. It will only be taken out of storage for exhibition. The only time I'll see it is when other people see it. As to why he chose to execute his sample with handwriting rather than mechanically (or even photographically), I do not know. Certainly no other person alive at the time had access to a grander research laboratory, and all of its associated resources, than Edison. In closing, when taking everything into consideration, one thing is certain: when Edison set out to do something, he did it with gusto. And that gusto is how we have the world's smallest handwritten micro script of the Lord's Prayer today. Brought to you by the hand and pen of Thomas Edison. Inspected, authenticated and officially certified (#83790641) through PSA/DNA, it is currently the only known Edison example of its kind in the world today. OUTREACH: We can visit your group, organization, home school group or church. Exhibition available beginning April 2019. Book today by calling (484) 387-5320, or email to: director@wondersofthebible.org (PA, NJ, NY, OH, MD, DE). 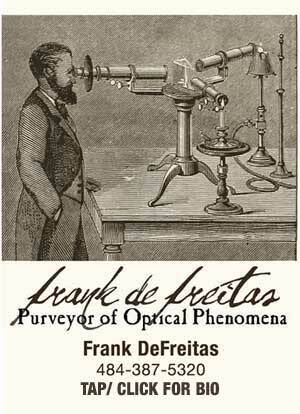 -- Frank DeFreitas is the founder of Wonders of the Bible, a collector of micro / nano Biblical scripture and art, and owner of the Thomas Edison micro script Lord’s Prayer. Featuring the world's smallest microscopic and nano-scale Biblical scripture and art. Some pieces are so small that they cannot be seen by the human eye ... only through microscopes. The "Lord's Prayer" has been the reference standard for micro miniaturization for over 150 years. Here is my attempt at the world's smallest via lasers and holograms: a Lord's Prayer written entirely in the area the diameter of a human hair (less than 100 microns). The Bible of the future will rely on the Nobel prize-winning achievements of lasers and holographic data storage. This hologram contains the entire King James Bible -- 1,245 individual pages, and 773,746 words in the area the size of a snowflake. * Header Photograph: Thomas Edison, full-length portrait, seated, facing front, with phonograph, 1 negative: glass, wet collodion, 1878, Mathew Brady, Library of Congress: LC-USZ62-98128, No known restrictions on publication.